Among the lingering issues related to the renewal process has been the northern corridor. The proposed roadway would connect Red Hills Parkway to Interstate 15 by way of Washington Parkway at Exit 13. As the route for the road cuts through the reserve, it has faced criticism from conservation and environmental advocacy groups. 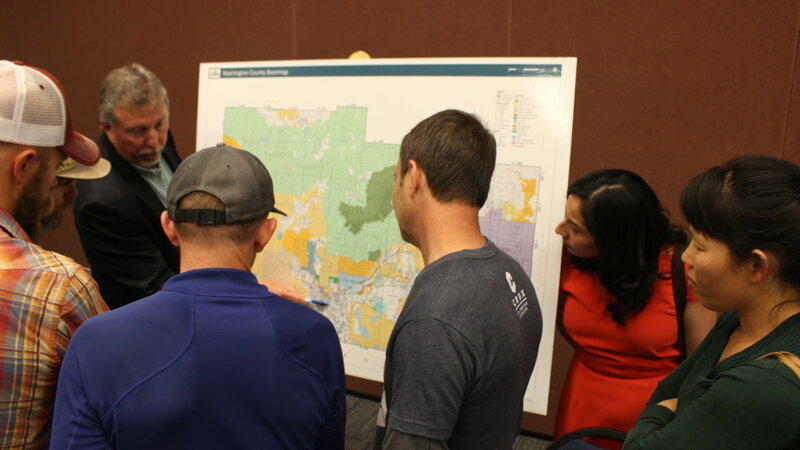 County and municipal officials contend that Congress promised the county a route for a northern corridor in the Omnibus Public Land Management Act of 2009. However, opponents of the roadway, such as the group Conserve Southwest Utah, argue no such promise exists. Iverson said the language in the 2009 bill was “squishy” and the language in the HCP expansion bill would help solidify it. Members of Conserve Southwest Utah were at the open house handing out fliers against the proposed roadway. Points on the flier argued that there are alternatives to the northern corridor and that it would decimate the character of the desert reserve. “A four-lane highway does NOT belong and isn’t necessary in a National Conservation Area that belongs to the public,” the Conserve Southwest Utah flyer stated. The HCP expansion bill, once introduced, would join previous legislation introduced to Congress by Stewart. The “Washington County, Utah, Public Lands Management Implementation Act” was introduced last year and would grant a “right-of-way” route for the northern corridor while also preserving utility access for local municipalities. 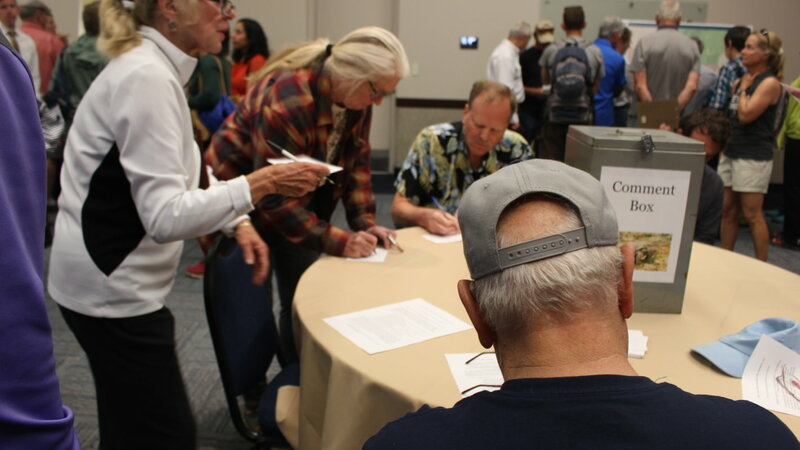 Under the HCP expansion bill, the right-of-way proposed in Stewart’s original bill would be changed to match a new route that is considered to have the lowest impact on the desert tortoise. The 6,865-acre area that would be added to the HCP has been named “Zone 6” and is said to process a higher-density of desert tortoises than currently within the Red Cliffs Desert Reserve. “The great thing about this property is that the population of the desert tortoise is actually higher there than in the protected habitat,” Iverson said. Based on data presented to the County Commission during a September 2017 meeting by Cameron Ragnon, the county’s HCP director, the population density is about 22.5 tortoises per square kilometer, which is higher than the reserve’s current 15.3 tortoises per square kilometer. The data is based on various surveys and sightings done across an area composed of land overseen by the BLM and the Utah School and Institutional Trust Lands Administration, more commonly known as SITLA. 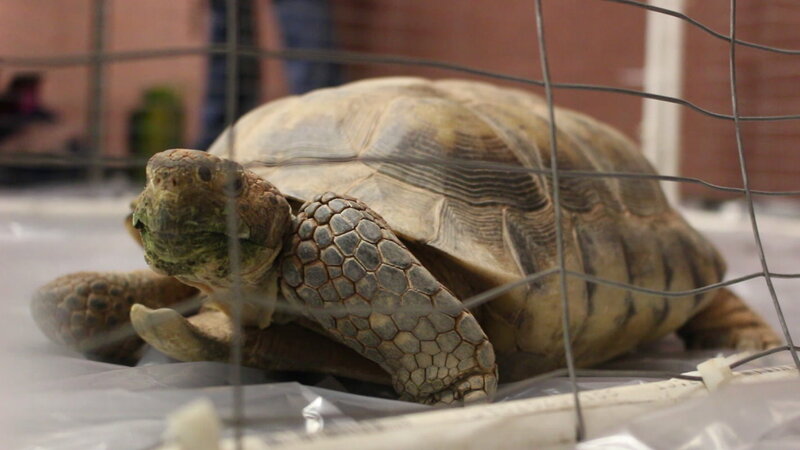 During the September meeting, Ragnon said it isn’t exactly known why the tortoise population is high in that area, though he did note that human activity may help in keeping predators away. Utah’s bounty on coyotes may also play a possible part in this. The area is heavily recreated by outdoor and off-road enthusiasts, including areas like the Bear Claw Poppy Trail System that is a playground for mountain bikers, ATV riders, climbers and many others. There are worries among cyclists and off-road motorists that they’ll lose access to the area should it become protected habitat. “To me, he bigger issue is preserving the current recreational use on this land that’s being considered, which would include mountain biking and the competitive events which draw a lot of visitors to our area like the Huntsman Senior games,” said Craig Shanklin of the Southern Utah Bicycle Alliance. The handout provided by county officials states the HCP expansion bill will allow continuing recreational use on designated trails, including hiking, biking, horseback riding and OHV use. A particular group that’s worried about losing access is the Desert Roads and Trails Society, also known as Desert RATS. Beiber and other members of Desert RATS said they worry that closing motorized access to the area could have a negative economic impact on tourism and that it could lead to the closure of other motorized routes in the future. According to his understanding of the HCP bill, St. George Mayor Jon Pike said, access to Zone 6 by larger motorized vehicles may be confined to the road that extends into the area by way of Navajo Drive in Bloomington. “There really wouldn’t be motorized use anywhere else in the 6,800 acres,” Pike said. St. George resident Richard Spotts said he was displeased about being unable to review the actual language of the HCP expansion bill. 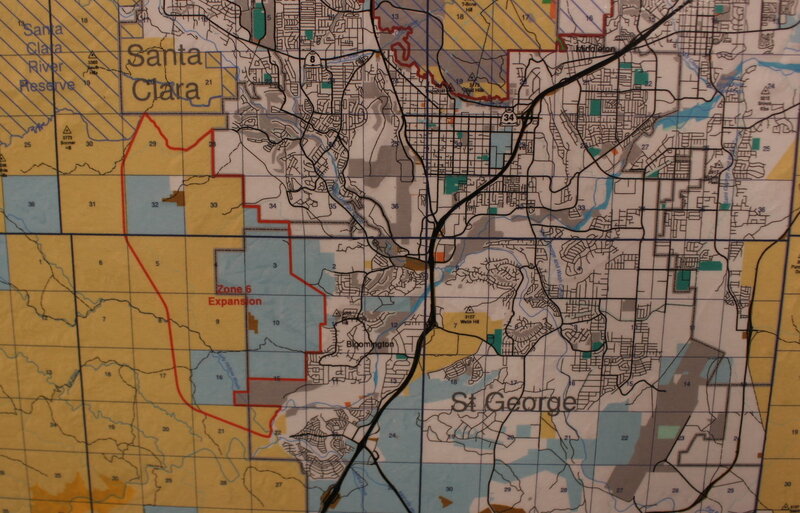 He also brought up the issue of the proposed “western corridor” that would connect I-15 to a western part of the county, most likely through the area of the pending Zone 6. Spotts called the HCP expansion a “bait and switch” and “a shell game” county and local officials were playing in order to get the roads they wanted, no matter the fact they would go through protected habitat. 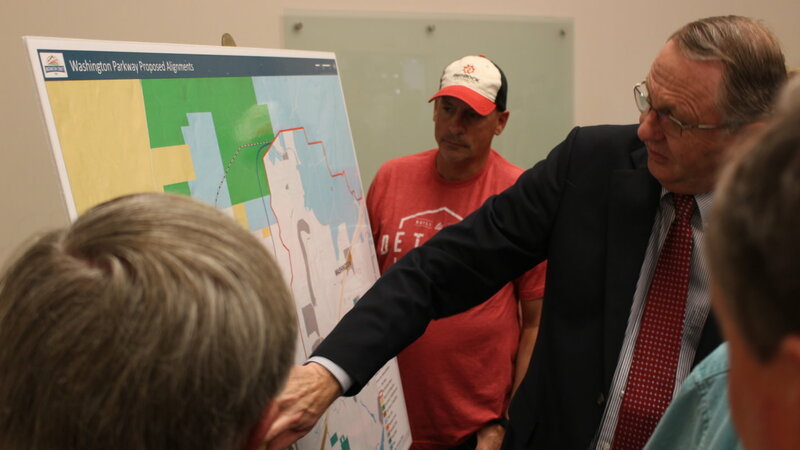 Whatever the final route of the proposed western corridor may be, both Pike and Iverson said it would have to be outside of the proposed 7,000-acre HCP expansion. The County Commissioners and local governments are attempting to use congressional action to sidestep regular federal processes for approval already set in place under the Endangered Species Act and National Environmental Policy Act, Spotts said. “I basically think this is the county’s propaganda session,” Spotts said. Soooo, what’s going to happen to the northern tortoises? They will be put in separate sections of the territory, islands if you will, where they cannot interact/breed with others with less territory than before. Idiots. Idiots is right! Not many of us want want to see a 4 lane highway thru a desert reserve habitat. “Officials” don’t give a crap about the tortoises. I wish the developing would slow down, we don’t need another 4 lane highway, a pipeline, more homes, more people. Save the tortoises. Only option? The best option?